The Gunn Historical Museum received The Michael Kammen Award, a prestigious national award with a $5,000 prize, and a Leadership in History Award, for the 2014 exhibit “Over There: Washington and the Great War” at the Annual Conference of the American Association for State and Local History (AASLH) in Detroit, Michigan on September 16, 2016. The AASLH Leadership in History Awards is the nation’s most regarded competition for recognition of achievement in state and local history. 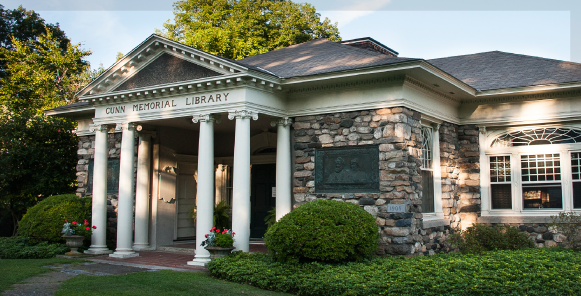 The Gunn Museum was presented with an Award of Merit by the Order of the First World War in 2014 and another by the Connecticut League of History Organizations in 2016 for its commemoration of the centennial of World War One in 2014 with the exhibit Over There: Washington and the Great War. The Gunn Museum was recognized for the exhibit and program series, Coming to America: Washington’s Swedish Immigrants. This innovative work was created in 2013 to commemorate the 125th anniversary of the Swedish Salem Covenant Church in Washington Depot and garnered two awards: an Award of Merit from the Connecticut League of History Organizations; and a Leadership in History Award from the American Association for State and Local History at the Annual Conference in St. Paul, Minnesota on September 19, 2014. The Gunn Museum and Shepaug Valley Middle School were presented a WOW Award and a Leadership in History Award from the American Association for State and Local History (AASLH) at their Annual Conference in Indianapolis, Indiana, and an Award of Merit from the Connecticut League of History Organizations. Shepaug Valley Middle School students under the leadership of their eighth Social Studies teacher, Michael Croft, transcribed and researched the Civil War letters of Washington resident Abner Mitchell, published a book of their work, and created an exhibit at the Gunn Museum. The WOW Award, given at the discretion of the AASLH Awards Committee, is an additional award for an Award of Merit winner whose nomination is highly inspirational, exhibits exceptional scholarship, and/or is exceedingly entrepreneurial in terms of funding, partnerships, or collaborations, creative problem solving, or unusual project design and inclusiveness. The Gunn Museum and Shepaug Valley Middle School received one of the five WOW Awards presented across the country in 2009. Click on the embedded links to learn more about the awards.